The Constitution, in all its provisions, looks to an indestructible Union composed of indestructible States. 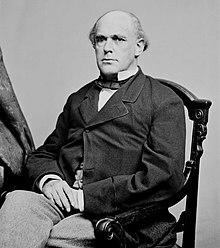 Salmon Portland Chase (January 13, 1808 – May 7, 1873) was an American politician and jurist in the Civil War era who served as U.S. Senator from Ohio and Governor of Ohio; as Secretary of the Treasury under President Abraham Lincoln; and as Chief Justice of the United States. For, what is slavery? It is the complete and absolute subjection of one person to the control and disposal of another person, by legalized force. We need not argue that no person can be, rightfully, compelled to submit to such control and disposal. All such subjection must originate in force; and, private force not being strong enough to accomplish the purpose, public force, in the form of law, must lend its aid. The Government comes to the help of the individual slaveholder, and punishes resistance to his will, and compels submission. THE GOVERNMENT, therefore, in the case of every individual slave, is THE REAL ENSLAVER, depriving each person enslaved of all liberty and all property, and all that makes life dear, without imputation of crime or any legal process whatsoever. This is precisely what the Government of the United States is forbidden to do by the Constitution. The Government of the United States, therefore, cannot create or continue the relation of master and slave. Nor can that relation be created or continued in any place, district, or territory, over which the jurisdiction of the National Government is exclusive; for slavery cannot subsist a moment after the support of the public force has been withdrawn. "The Address of the Southern and Western Liberty Convention", in Anti-slavery Addresses of 1844 and 1845 by Salmon Portland Chase and Charles Dexter Cleveland, ed. C. D. C. (London: Sampson Low, Son, and Martson, 1867), pp. 75–125. Address accepting a testimonial of gratitude from the colored people of Cincinnati for the advocacy in the case of Samuel Watson (February 12, 1845). No more slave States; no slave Territories. Platform of the Free Soil National Convention (1848). When Texas became one of the United States, she entered into an indissoluble relation. All the obligations of perpetual union, and all the guaranties of republican government in the Union, attached at once to the state. The Act which consummated her admission into the Union was something more than a compact; it was the incorporation of a new member into the political body. And it was final. This page was last edited on 17 March 2019, at 16:04.